Highfield Park is a Queen Anne mansion near Hook in Hampshire, now independently managed, with 58 bedrooms for overnight accommodation. Set on the top of a hill it boasts great views over the Hampshire countryside. It features two rooms licensed for civil ceremonies and unusually has Heckfield Church sat literally next door which is ideal if you prefer a church wedding followed by a reception only a few yards walk away. 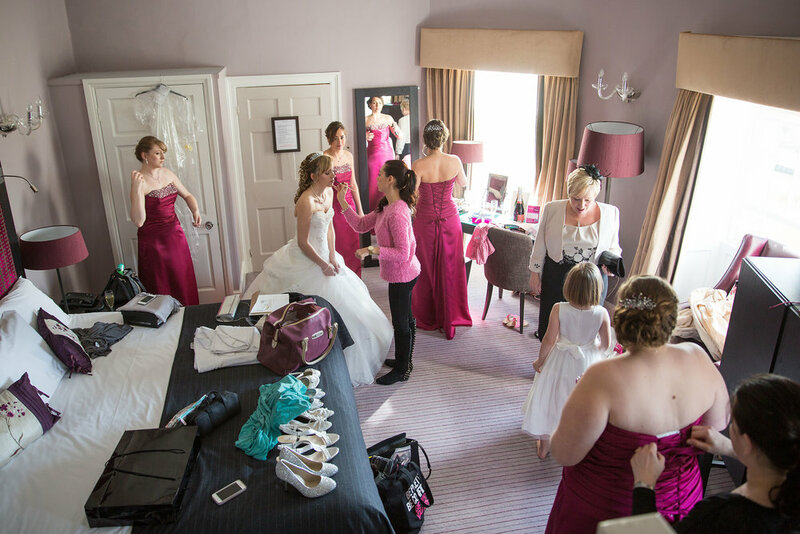 The dual aspect split-level bridal suite at Highfield Park situated at the top corner of the building is ideal for the bride to get ready before the wedding ceremony. 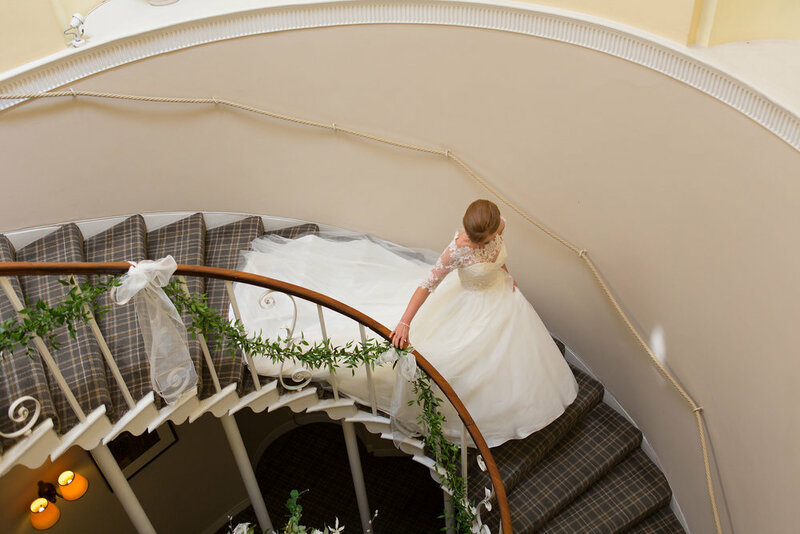 There is a spectacular spiral staircase in the middle of the house which can be used to make a grand entrance down to the ceremony room. 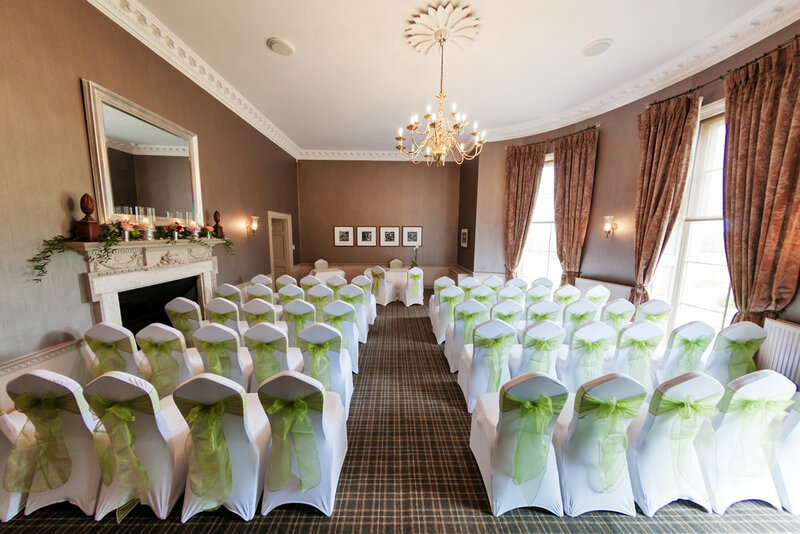 Most civil wedding ceremonies at Highfield Park use the Wellington Room which seats around 80 guests. The room can be prepared in 2 ways, either width wise with a short aisle and registrar's table in the window, or length wise with a long aisle with the table at the far end of the room (see photos below). Obviously there are pros and cons of either layout but purely from a photographic viewpoint the photographs of you during the ceremony are much better with the short aisle as there is loads of natural light coming in from the windows so you look great and we also get good backlit shots from the back of the room. In comparison the long aisle leads to you making your vows in a dark corner of the room, the rest of the room is very unevenly lit, so it's not great from a photographers viewpoint. We will get the best photographs possible from either layout so the final decision is up to you. Width wise layout with short aisle with registrar's table in the window. Great natural light from the window. Length wise layout with long aisle and table at the far end of the room. Great expressions but it's a bit dark away from the window. 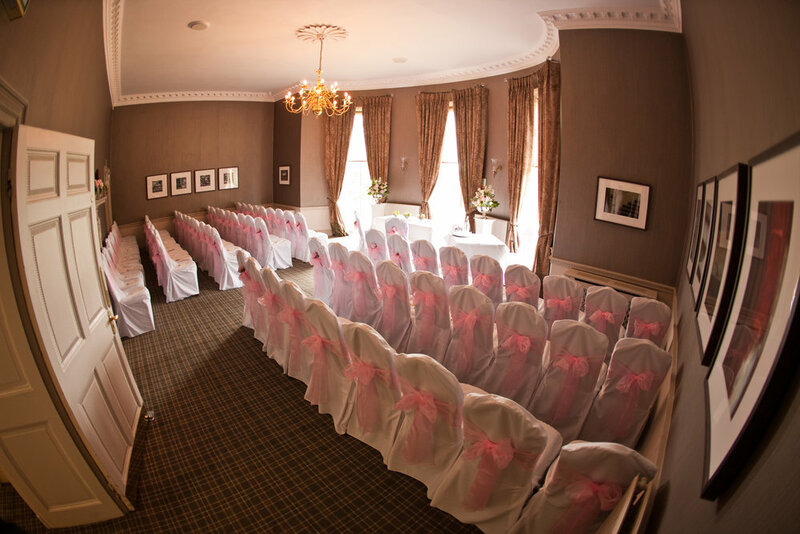 The larger Chamberlain room is more suitable for larger weddings seating up to 120 guests. 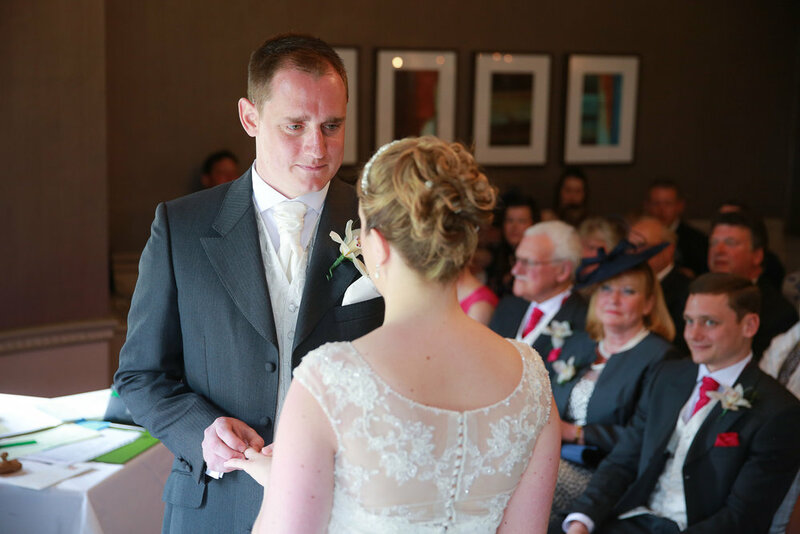 We have a very good relationship with the Hampshire registrars who officiate at these civil ceremonies. They know we work in a very discrete manner, not using flash or disturbing the ceremony in any way, so they allow us a great deal of freedom to capture some wonderful wedding photography at Highfield Park. 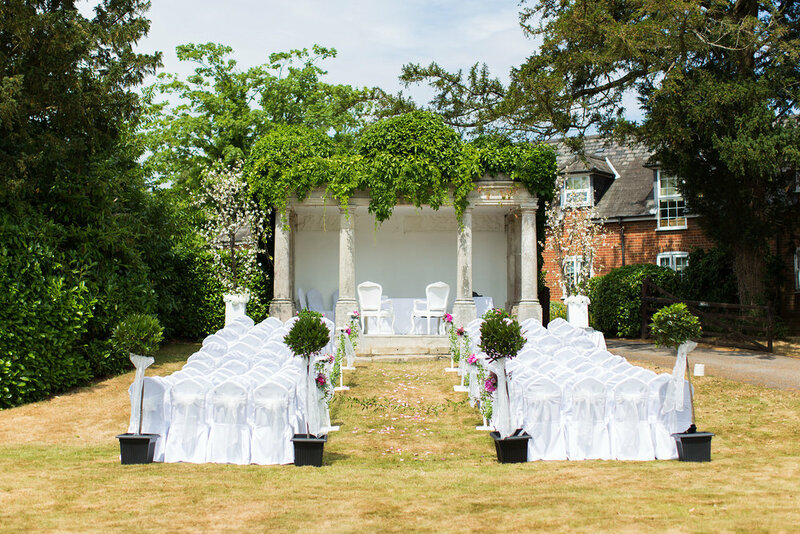 You can now choose to get married outdoors in the grounds of Highfield Park at The Folly. This stone structure is a spectacular location for your ceremony and we will capture some fantastic wedding photographs for you. Highfield Park has extensive grounds with lots of space for people to wander around and for us to take wedding photographs. A few hundred yards away is The Folly – a stone gazebo which is ideal for taking a few romantic images of the bride & groom together away from the main party. As ever we take a group photograph of everyone as Adam leans out of a first floor window, while Jan captures the action from ground level. Smaller wedding parties can use the Wellington room for the wedding breakfast, whereas larger parties are comfortably seated in the Chamberlain room. Once your meal has been served and the speeches are over the room can be turned around ready for the evening entertainment while the wedding guests relax in the bar. a DJ or live band can easily be accommodated within the Chamberlain room providing music for your first dance and dancing until late in the evening. 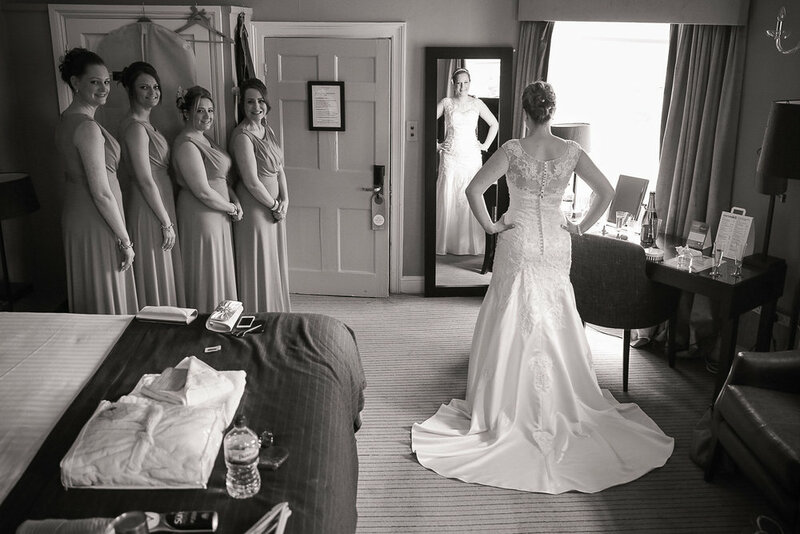 Here is a short video showing highlights of recent weddings we have photographed at Highfield Park, both indoors, outdoors and at St Michael’s Church next door. We hope you enjoy it! Click here to view a separate page we created about wet weather weddings which features a really wet wedding at Highfield Park. If you have any questions, would like more details, or you would like to book us to photograph your wedding at Highfield Park, please call us on 01276 683712 or contact us now.